ST. GEORGE — A collision on River Road Monday could have ended up a lot worse had it not been for fast-responding bystanders. The collision occurred at approximately 10:20 a.m. when a motorcyclist attempted to pass a truck pulling a trailer southbound River Road. “The truck and trailer were preparing to turn (right) into the business complex,” St. George Police Lt. Jeff Bahlmann said. However, at the same time the truck was pulling into the lot, Bahlmann said, a black Chrysler 300 was pulling out to turn north on River Road. The motorcyclist pulled out from behind the truck and trailer to pass it, not realizing the car was pulling out at the same time. “The female (in the Chrysler) pulled out and a collision occurred with the motorcycle,” Bahlmann said. 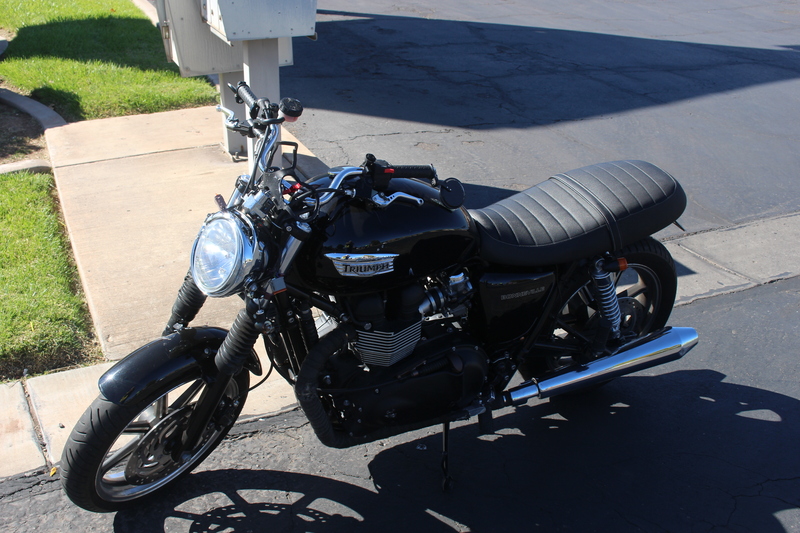 The motorcycle, a Triumph Bonneville, was laid down before impact with the Chrysler, and the rider ended up pinned underneath the car. He was initially not breathing, but bystanders were able to lift and jack the car off him quickly, and by the time he was transported he was breathing and talking to paramedics. 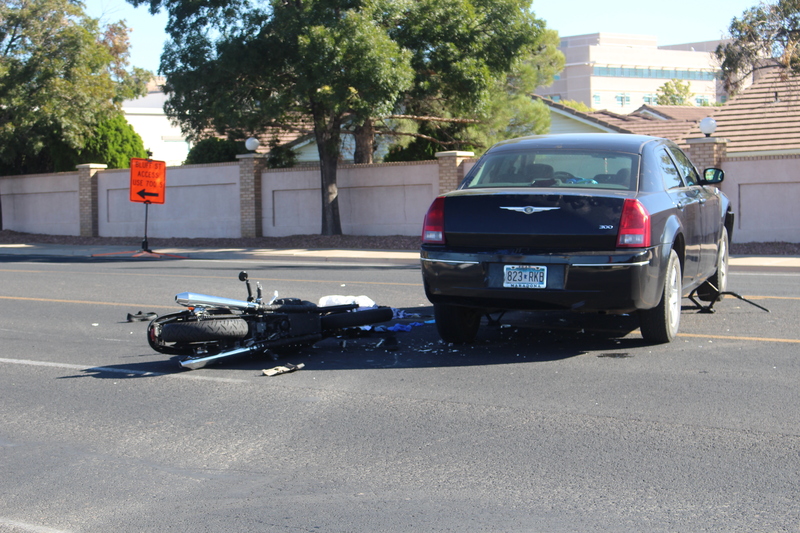 The rider was taken to Dixie Regional Medical Center in St. George. Injuries to the rider were unknown at the time of publication. No other injuries were reported. The rider was wearing a helmet and the driver of the car was wearing her seat belt. Citations are still pending until the investigation has been completed. The collision kept southbound River Road closed for almost two hours. Northbound was opened to one lane of traffic about 11 a.m.
Bahlmann asked any bystanders involved in the quick rescue or witnesses to the accident to please contact him so a statement can be taken. “We’d like to speak with them and give them our thanks for assisting with this,” Bahlmann said. He can be reached through dispatch at 435-627-4300.